Last night I went out with Matt and Andy to a bar downtown. We met up with one of Matt's teachers at his school. She was from Sevilla but lived in London for a few years so she spoke English really well. She wanted to practice it seemed like so we spoke most of the time in English. 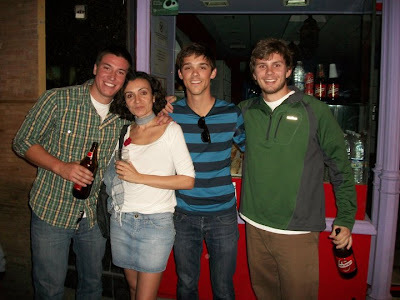 After the bar we went to Plaza del Salvador and got a few drinks. 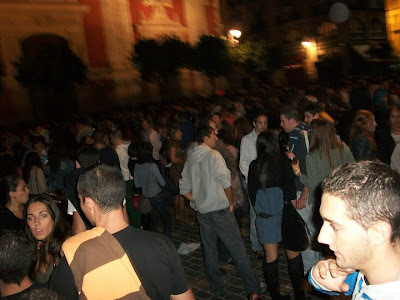 The Spanish way of drinking is either buying alcohol or beer and drinking in plazas. They call it a botellón. It is very popular in Southern Spain. It is a cheap alternative to going to bars because its legal and you don't have to pay for overpriced drinks. This morning I slept in and then took a trip to the "mall" they have hear. I wanted to check out what all was in there and also stop at the soccer stadium to see when the next Sevilla FC game was. They have a game this Sunday and the tickets are half off. I think I am going to go buy a ticket tomorrow. I am really excited to go see a game, hopefully someone else will be interested in going. On the way back home I was walking past the train station. On the way over I saw two cops next to this guy who looked really messed up. I honestly thought he might be dead. He was in front of the train station slouched over on this ledge. He had no shirt on and looked like he had not showered in weeks. He was in the most awkward position and it looked like he puked earlier. I was a bit shocked and didn't really know what was going on. When I came back past the train station on the way home I noticed that there was an ambulance there and the guy was not where he was before. I maybe thought they had him in the ambulance but then looked a little bit down the hill and hey was passed on the top of these steps with like 8 police officers around him. A medic put a towel under his had from support. I finally saw the guy move a little bit, but he looked like he was in pretty bad shape. I don't know what that was all about but it was crazy. I went grocery shopping and bought some BEEF. Finally. I went home and made a big hamburger with onions and gouda cheese inside with avocado on top. haha. I remember when we were in Italy and we found a McDonald's we thought we found the Mother load. Your burger looked yummy. To bad about that guy on the road. Where am I again? Bellingham or Sevilla? !